Your new lifestyle awaits! The Willow is an entertainer's paradise. Enter the top floor through bold pivot door into open floor plan w/ sweeping eastern canyon views through walls of glass that open on your command. Enjoy a balcony that spans the width of the house on two floors. Modern amenities such as gourmet eat in kitchen w/ Carrera marble counters, formal dining area, and living room featuring built in cabinets & fireplace. Move down to the private living quarters comprised of 3 bedrooms & 3 baths featuring a luxurious master suite w/ double vanity, fireplace, his/her closets, large vogue shower & separate unique soaking tub that's privately positioned on the exterior deck for au natural bathing. Enjoy faux grass side yards featuring in ground spa, & gas fire pit with seating area. Want to bring the party home? 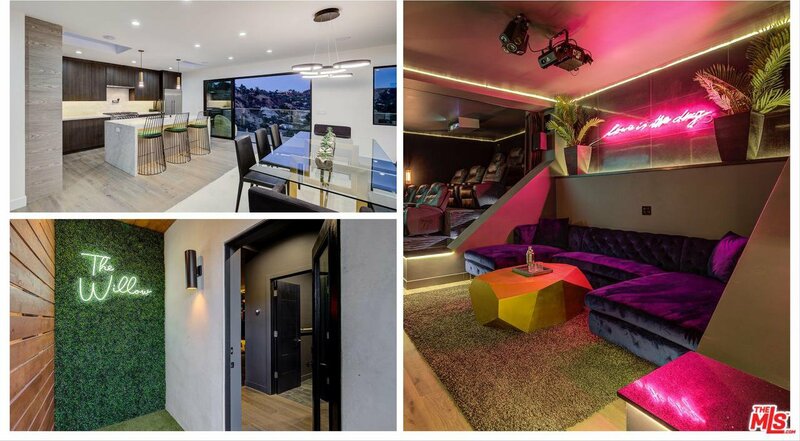 Accessed through separate entrance, the bottom floor features a 9 seat theater room, custom lounge, mirrored bar, powder room & neon selfie wall for endless summer nights. Courtesy of Keller Williams Beverly Hills, Shawn S. Kormondy - CA DRE#01451888 Selling Office: Pinnacle Estate Properties, In.